Enter a valid postal code. Enter a valid postal code. The Love's Journey Basket arrangement is a clean and pretty way to share your love and thoughts of sympathy. Arranged in a wicker basket with all white flowers. 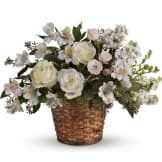 • A variety of beautiful white flowers such as roses, spray roses, alstroemeria, larkspur and more are lovingly arranged in this tribute. 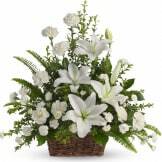 • This arrangement measures approximately 18 1/2" W X 14" H.
Flowers will be received by a Affordable Cremation Services' staff. This month, I've ordered twice from the Sympathy Store. It was so easy. 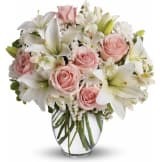 I live outside of the United States and have in the past, found it difficult to order flowers for relatives in in U.S. Ordering from Sympathy Store is uncomplicated. Also, my cousin says the flowers we sent on 12th August are still on display. Thank you for your fine service. Arrived for the viewing, flowers were fresh and beautiful. Family was very pleased with the arrangement. The flowers were beautiful, very nice arrangement. I was impressed with the freshness of the flowers. 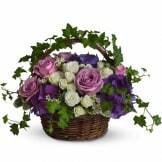 All of our flowers are designed and delivered by hand from a local florist in in Collingwood.